What's an unemployed mascot to do after the biggest sporting event in the world, has packed up and left the city? The Homeless Quatchi Project attempts to continue where the story left off. It began as a vinyl toy figure. What then followed was a series of photos taken throughout the city during the Vancouver 2010 Winter Olympic Anniversary in 2011. 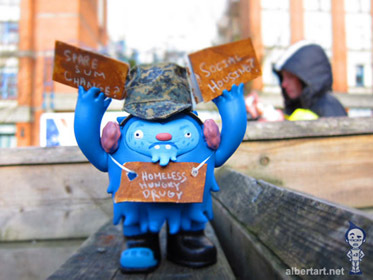 Homeless Quatchi has since expanded into a print comicbook series, as well as an online webcomic. Homeless Quatchi has appeared at: Canzine West Vancouver, Vancouver Comic Arts Festival, Fan Expo Vancouver, Vancouver Comicon. Q: Who is Homeless Quatchi? A: A homeless sasquatch from the forests of Northern British Columbia. A: Don't tell Homeless Quatchi that. Q: What happened to those other mascots? A: They're all homeless living in the DTES, but are known to venture around Vancouver and the lower mainland in search of opportunity. Q: What's this all about? Why are you making fun of homelessness? A: Read the comics and blogs. Homelessness is not a laughing matter. The Homeless Quatchi Project takes idealized cartoon characters and puts them through life situations that are relatable to just about anyone. Q: Have you been sued? A: No. Homeless Quatchi is a work of parody, satire, and social crticism. A political cartoon, with heart. Q: Why are you linking to Amazon.com? A: Don't expect Homeless Quatchi to be academic reading. If you'd like to read more serious commentary on homelessness in Vancouver, Amazon has a very good selection of books. Educate yourself. Q: Is Homeless Quatchi associated with any charity? Q: Can Homeless Quatchi come to my birthday party? A: No. Homeless Quatchi does not make private appearances. Q: Where will Homeless Quatchi appear next? A: Follow Homeless Quatchi on Twitter, Google+ and Facebook for all the latest info on his whereabouts. Q: How does Homeless Quatchi get around town? Q: Is Homeless Quatchi the vinyl toy for sale? A: No. Only one Homeless Quatchi vinyl toy has been made. If you're interested in reading further about the homeless situation in Vancouver, check out your local library or find something online and support these authors.